The Czech Republic's central European landscape is dominated by the Bohemian Massif, which rises to heights of over 3,000 ft (1000 m) above sea level. The land covers about 30,000 sq mi. and is divided in three major regions, in the west Bohemia, in the east Moravia, and in the north Silesia. The capital of the Czech Republic, Praha (Prague) is often called "The Heart of Europe" as it is located in the middle of the Continent. 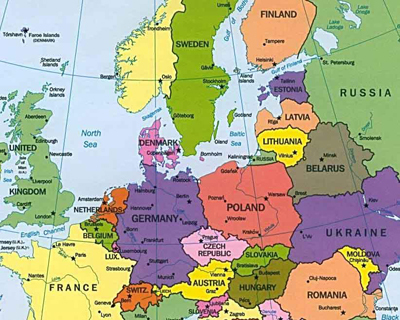 There are over 10.5 million people in the Czech Republic and about 1.3 million people in Praha. Under Communist rule until 1989, the Czech Republic (Ceska Republika), shared a common federal government with Slovakia until 1993, is now an independent state with democratic, multiparty institutions. The Czechs are a Slavic people, closely related to the Slovaks in speech and custom, but with a distinct history and national identity. The term "Czech" denotes the inhabitants of historic Bohemia, Moravia, and Silesia, while "Slovak" is reserved for those people who settled on the southern slopes of the Carpathian Mountains and who historically were dominated by the Hungarians. Between the fifth and seventh centuries, the Slavic ancestors of the Czechs swept across the region of Bohemia, Moravia, and Silesia. That subsequently became known as the kingdom of Bohemia. Although for a time assimilated into the neighboring Moravian Empire, Bohemia emerged as the stronger power and absorbed Moravia in the eleventh century. Under its ruling dynasty, the Přemyslides, Bohemia became Christian in the ninth century and a member of the Holy Roman Empire. 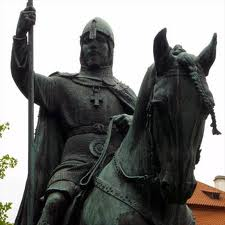 Two prominent rulers of the House of Přemsyl were Wenceslas the Holy (c. 907-929) and Otakar II (1253-78), who extended Bohemia's territorial borders to the Adriatic. After the decline of the Přemsylides, Bohemia was ruled for a time by the House of Luxembourg. The union of King John of Luxembourg with the Czech princess Elizabeth produced a son, Charles IV (1346-1378), who, as emperor of the Holy Roman Empire, established Bohemia as the center of the empire and made Prague its cultural center. He founded the University of Prague in 1348. In the fifteenth century the university became the center of a church reform movement led by Jan Hus (1369-1415), who was burned as a heretic in 1415. Divided between the followers of Hus—the Hussites—and the Catholics, the country was attacked by crusaders and plunged into turmoil. Through a dynastic union with the Jagiello family in Poland, the kings of Bohemia eventually became linked to the House of the Austrian Habsburgs (Austro-Hungarian double monarchy), which ruled there from 1526 to 1918. Favoring monarchical control over the Protestant Reformation, the Habsburgs opposed the Czech estates. The Czechs rebelled in 1618, precipitating the Thirty Years' War (1618-1648). Defeated in 1620 at the "Battle of the White Mountain", they were ruled for the next 300 years as part of the Austrian (Habsburg) Empire, with German becoming the primary language of instruction in the schools. However, a national awakening in the nineteenth century, culminating in the political protest movement of 1848, re-established a sense of Czech identity. After the Austrian declaration of war on Serbia and Russia in 1914, the Czechs and Slovaks, in a struggle to establish a common republic, joined the side of the Allies. Under the leadership of Tomas Garique Masaryk (1850-1937), Edvard Beneš (1884-1948), and Milan Rastislav Štefanik (1880-1919), they were able to persuade the Allied governments to dissolve the Austrian (Habsburg) Empire. Despite cultural differences, the Slovaks shared with the Czechs similar aspirations for independence from the Habsburg state and voluntarily united with the Czechs. This union lasted for 75 years. With the surrender of Austria on October 28, 1918, a revolutionary committee in Prague declared the establishment of the Czechoslovak Republic, encouraged by, among others, U.S. President Woodrow Wilson. The Czechoslovak Republic, a parliamentary democracy, was governed from 1918 to 1935 by Tomas Garique Masaryk, who was succeeded by his pupil Edward Beneš. Although Czechoslovakia was the only east European country to remain a parliamentary democracy from 1918 to 1938, it was plagued with minority problems, the most important of which concerned the country's large German population. Constituting more than 22% of the interwar state's population and largely concentrated in the Bohemian and Moravian border regions (the Sudetenland), members of this minority, including some who were sympathetic to Nazi Germany, undermined the new Czechoslovak state. Internal and external pressures culminated in September 1938, when France and the United Kingdom yielded to Nazi pressures at Munich and agreed to force Czechoslovakia to cede the Sudetenland to Germany. Fulfilling Hitler's aggressive designs on all of Czechoslovakia, Germany invaded what remained of Bohemia and Moravia in March 1939, establishing a German "protectorate." By this time, Slovakia had already declared independence and had become a puppet state of the Germans. But after occupation by the invading forces of Adolph Hitler in 1939, the republic never completely regained autonomy. In the aftermath of World War II, the Soviet troops overran all of Slovakia, Moravia, and much of Bohemia, including Praha (Prague). In May 1945 U.S. forces liberated the city of Plzen and most of western Bohemia. The former government returned from London in April 1945 when the war ended and the country's pre-1938 boundaries were restored. When elections were held in 1946, Communists became the dominant political party and gained control of the Czechoslovakian government in 1948. Thereafter, the former democracy was turned into a Soviet-style state. A trend toward democratic liberalization in the 1960s culminated in the events of the Prague Spring in 1968, when a cultural revolution headed by the reformer Alexander Dubček was suppressed by the military intervention of the Soviet Union and the Warsaw Pact allies. Under Soviet leader Mikhail Gorbachev, a further period of liberalization began in the 1980s that led to the downfall of Communism in 1989, when largely peaceful strikes and demonstrations, known as the "Velvet Revolution", in Prague swept aside the old regime and elevated dissident playwright Vaclav Havel to the presidency. 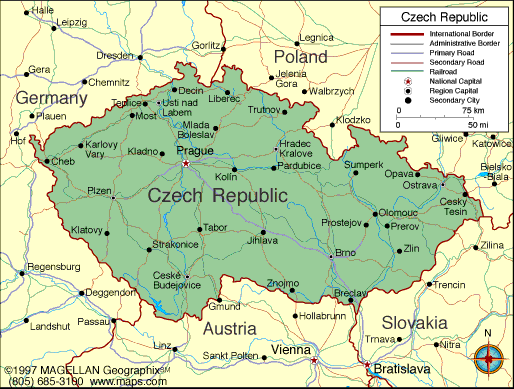 After a brief coexistence in a federation with Slovakia, the Czech Republic became fully independent in 1993.